It's so easy to damage your alloy wheels and expensive, inconvenient and time consuming to get them refurbished. However, E-Tech Engineering has come up with a solution for repairing deep scuffs and scratches, curb damage to the wheel rim and most other superficial non-structural damage. 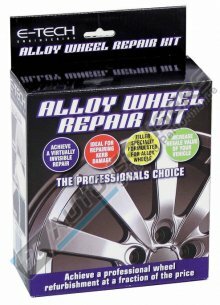 The E-Tech alloy wheel refurbishment kit provides all the components you need to repair your alloy wheels yourself and contains detailed instructions of how to achieve a professional finish that is virtually invisible to detect. So if your alloys are scuffed and looking second hand for a small investment in time and money you could dramatically improve the appearance and value of them and your car. 400ml tin of alloy wheel lacquer spray. 400ml tin of Competition Black alloy wheel spray paint. 10cm tube of E-Tech alloy wheel putty. 3 sheets of sandpaper (Coarse x1, Medium x1, Fine x1).